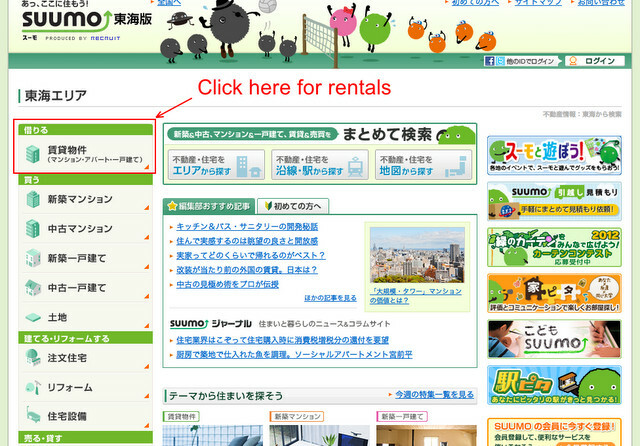 We're finally back with part two on how to find an apartment in Japan. In part one, we discussed ways to find apartment rental listings and real estate agents and gave you some helpful search words. 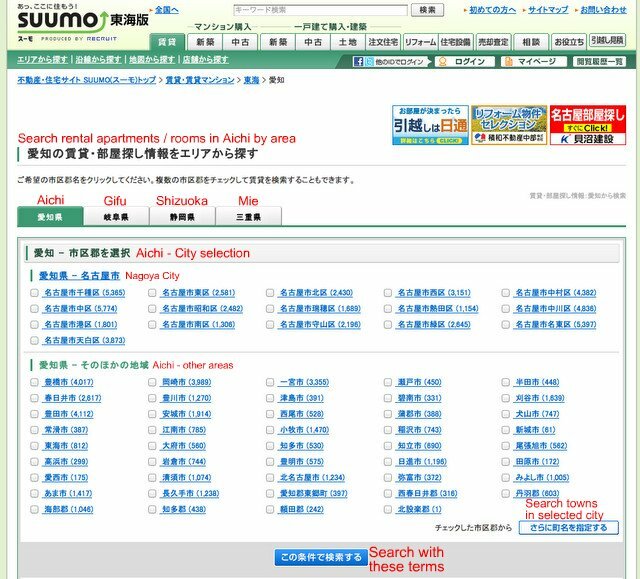 Today, we're going to walk you through how to use Suumo, which is one of the Japanese apartment listings sites we listed in part one. As to be expected, each site is different, but most of the vocab below should be helpful when searching online in Japanese. 1. Go to Suumo's site. 2. Choose the region you'll be moving to. 3. Make sure you're looking at rentals (賃貸), as some sites will want you to choose what exactly you're looking for, whether buying or renting. 4. Choose how you want to search, perhaps by train line or area, commute time, map, road map, rent, or real estate office. 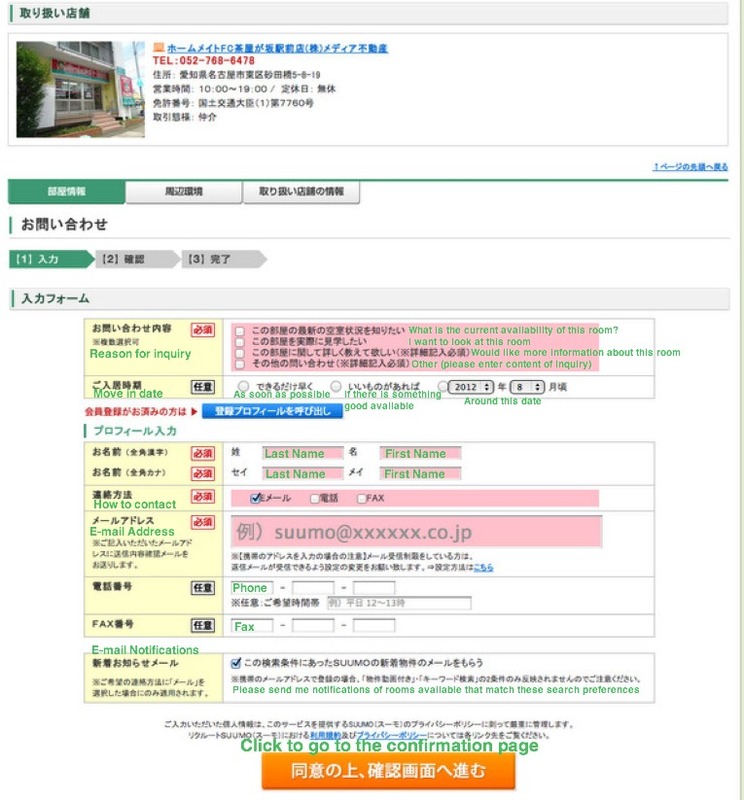 If you know some Japanese, you can also search using keywords. However, if you want to choose other options first, scroll down the page before clicking the blue button (see second image below). As you can see below, you can choose any options or preferences (although the less you choose, the more listings you'll see, which is good to keep in mind for smaller cities). Once you've chosen your desired preferences, click the blue button at the bottom. 6. The next page shows the results. If you didn't set any preferences on the previous page, you can adjust them in the left sidebar below. 7. The following image is an example listing. You can see an image of the apartment in the far left column, followed by the location, distance to train station or bus stop, monthly rent plus additional fees, key money and safety deposit, size, which direction it faces, what type of building it is and how old it is. You might see an area (such as in the yellow box in the image below) describing what pictures are available for the unit or house. To see the listing, click the address link (in blue) or the image. 8. The following image will be at the top of a listing's page, with essentially the same information as the previous page. 9. There are three tabs below the top part of the listing page. 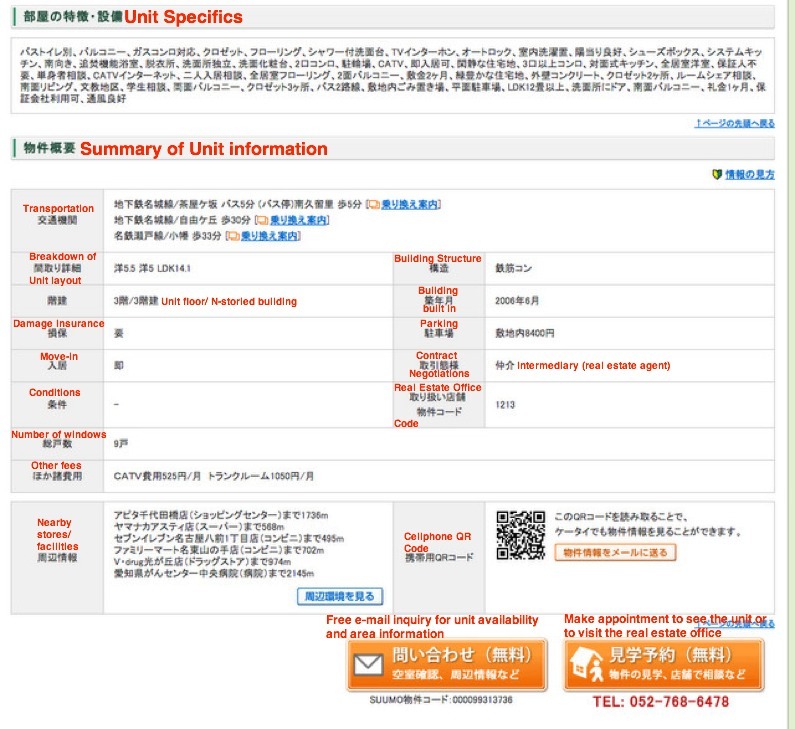 The first (which should appear by default) is the unit information, followed by neighborhood information and finally the real estate office info. 10. If you scroll down the apartment information page, you'll see a section with specifics about the place (what's included and other details). Next is a summary of info such as transportation, layout, the floor it's on in the building (if applicable), when you can move in, damage insurance, building structure, age of building, parking, conditions, number of windows, nearby stores and others. Included info will vary by listing. 11. 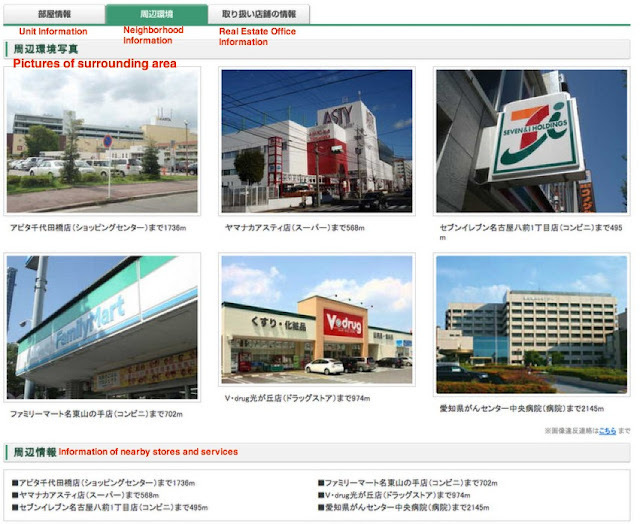 The second tab lists general info about the neighborhood, such as the closest supermarkets, convenience stores and other important facilities. 12. The final tab lists info about the real estate office. 13. 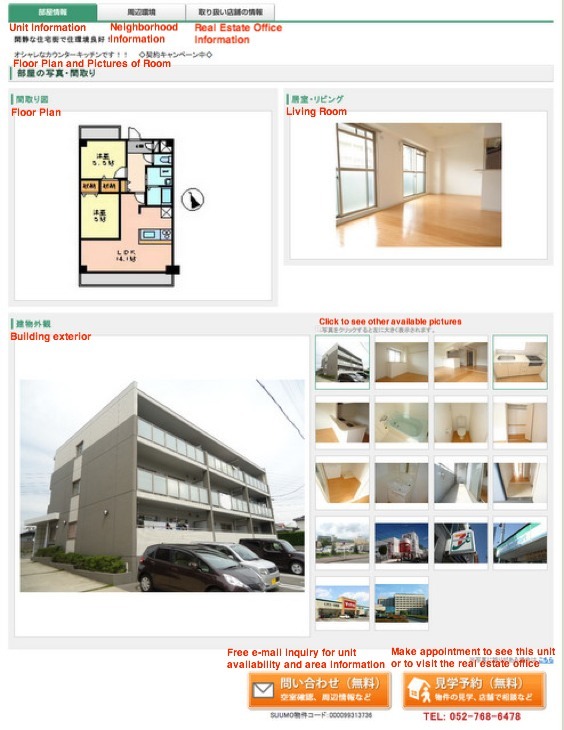 If you're interested in the apartment, you can make an inquiry directly from the page (translations for the input fields below) or you can contact the real estate office directly if you prefer. 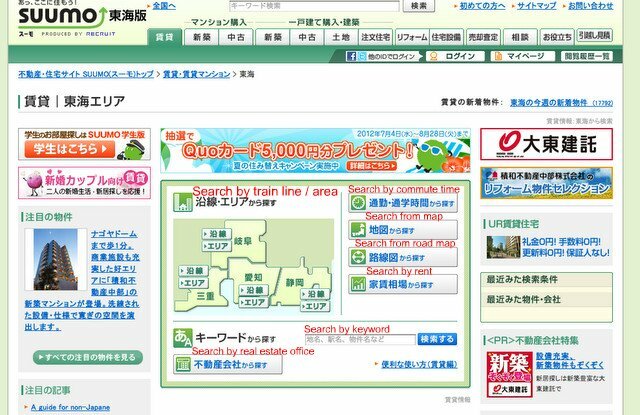 Hopefully this will get you started with your apartment hunt, but remember that you can also ask a real estate agent to search for you, and in major cities you might be able to find a real estate agency that offers services in English if you can't speak Japanese. For example, Surviving in Japan's current sponsor, the H&R Group, can help you find a place to live in Tokyo, Nagoya or Osaka. See part one for more. Many thanks to David Thompson (husband) for doing the translations for this post! 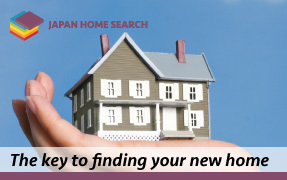 This post was brought to you by Surviving in Japan's November sponsor, Japan Home Search, a service provided by the H&R Group and one of the most extensive English real estate and apartment listings in Japan to help you find the perfect home when relocating or moving to Tokyo, Osaka, or Nagoya.